When you were a kid, did you ever have to write sentences for bad behavior, such as: “I will not talk back” or “I will not call out in class” 20 times? Have you ever wondered why this is such a popular form of discipline? The answer has a lot to do with the art of writing—actually taking a pen or pencil and writing words on a piece of paper. And this isn’t just relevant to children, but to anyone. For instance, when studying for the NY Bar Exam or the Uniform Bar Exam, there is so much information to go over, and although you may start studying well in advance and then take an intensive review course for twelve weeks leading up to the test, it still may feel like you won’t be able to properly go over what you learned in law school. It’s like everything went in one ear and out the other. You took some notes on your laptop, but you’re still feeling overwhelmed. Who knows what you learned in that class on civil procedure? The key is writing notes. And then writing more notes—both during law school and while studying for the bar. The lasting effects are so much greater than that of a mouse and keyboard, or even a touchscreen. However, writing may seem like a foreign concept to some people who have come of age in the digital sphere. There are those who go months without writing anything down because they text reminders to themselves or keep a to-do list on their phones. 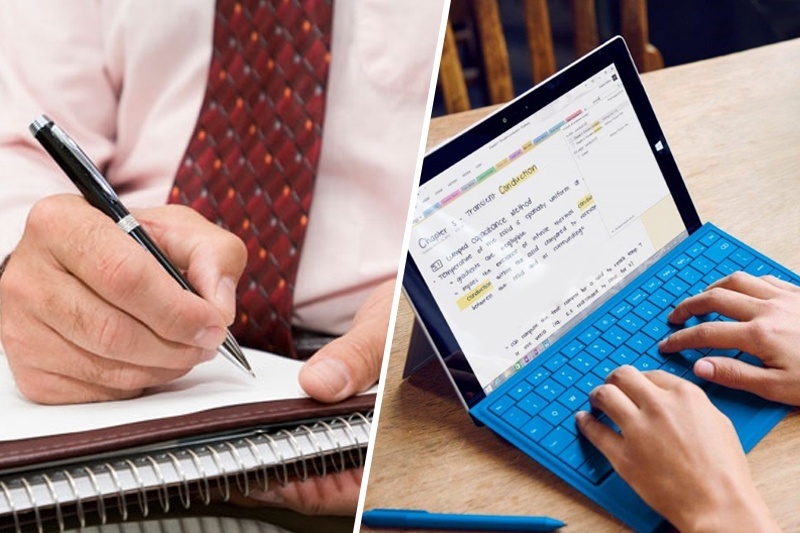 So when it comes to writing vs. typing notes, it’s not surprising that many people opt for their laptops or tablets rather than a pen and paper. They do everything else on these devices, so they might as well take notes on them too. It’s fast. It’s easy. It’s basically the same as writing in a notebook, right? Wrong. Studies have shown that it is more effective for students, in particular, to retain information when writing notes rather than typing them. For example, The Association of Psychological Science—a nonprofit organization that reports about studies and findings in the field of psychology—discussed a specific study in April 2014. Besides the fact that a computer disrupts your focus in the classroom —as pointed out in the article—because of its easy access to the Internet, it also doesn’t allow you to absorb what you’re learning as effectively as you would if you were to use a pen and paper. When you write something down, you’re more likely to remember that information. There’s a focus on writing each sentence, each word, each letter. After a while, you’ll be writing, “I will not talk back,” without even thinking about it because your hand is so used to that movement. Plus, you’re reading as you write, which reinforces the information even more. You’re working a lot harder. When typing on a computer, you don’t even have to look at the screen. Studying for the bar may still be stressful, but writing out essential concepts as you review your notes again and again will only help you retain what you need to know on evidence, contracts, torts and the rest of the subjects on the exam much quicker.